Here’s the one power that is defined, delineated by the Constitution, that resides with the Congress, to declare war. And they have abdicated that responsibility. Shields was clear: Going to war needs a serious discussion. JUDY WOODRUFF: You said it needs a healthy debate. Is it getting that kind of debate right now? 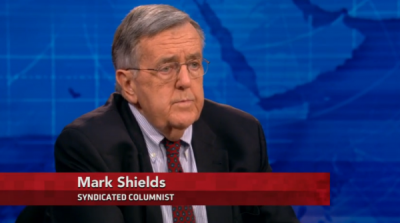 MARK SHIELDS: No, it isn’t. The United States military… has shown its ability, its capacity to come in and dominate the battlefield. But the idea of establishing order, security and peaceful government in its wake after that has eluded us. Who are the troops who are going to be there to guarantee stability, order and some sense of justice in the areas? You can’t do that with airstrikes. I mean, airstrikes are wonderful. They’re antiseptic. They’re at a distance. The possibility of your own casualties is finite. But they don’t occupy. You can’t occupy a nation or bring order and stability by airstrikes. So who are people on the ground? Who is the coalition? Where are the troops coming from? If Shields–and PBS, for that matter–believe in having a full debate about this war, they will need to find a more forceful critic of Obama’s latest war.